Starting life online, Ross & Brown became a bricks-and-mortar space in 2015, basing itself in Cheam Village on the London outskirts. 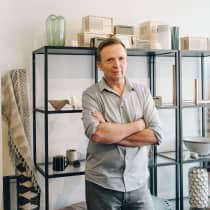 Founded by Peter Ross and Gary Brown, they have combined their extensive experience in commercial interior design alongside a passion for Nordic design. Ross & Brown boutique is home to stylish, design-led homeware and accessories to add a Scandi statement to any home. "We never meant to set up a Scandi boutique but everything seemed to fall into place and before we knew the Scandinavian obsession took hold. I like to think we were advocates at the start of its resurgence in the UK."